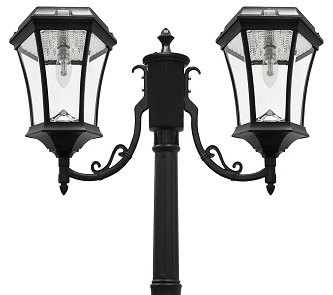 Add an energy efficient light to your landscape with this Victorian Solar Lamp Post Light with 2 solar lights. This lamp post light has the latest technology the solar light bulb that will provide ample lighting up to 300 Lumens when fully charged. With its elegant design and cast-aluminum powder coating black finish, this solar post light will illuminate up to 12 hours at night. Great addition to your entry way, driveway and landscape.